Turkey's president: Khashoggi death "savage"
ANKARA, Turkey -- The Turkish president presented no new evidence to the world on Tuesday from his country's investigation into the killing of Saudi writer Jamal Khashoggi, as skepticism intensified about Saudi Arabia's account that he died accidentally in its consulate in Istanbul. President Recep Tayyip Erdogan had said he would "go into detail" about the case that has shocked the world and raised suspicions that a Saudi hit squad planned Khashoggi's killing after he walked into the consulate on Oct. 2, and then attempted to cover it up. The key piece of evidence -- which, if it exists, the Turks have been keeping to themselves -- is a purported audio recording of the killing itself. Turkish officials have leaked gruesome details of the alleged recording to the media over the past two weeks. However, both the Turks and U.S. officials say no such audio has been shared, and thus far its existence has not been proven. Erdogan said on Monday that he would reveal to the world the "naked truth" about what happened in the Saudi consulate, but addressing lawmakers in the Turkish parliament on Tuesday, the Turkish leader added little more than rhetoric to the scandal, accusing the Saudi government of a "savage," premeditated "political murder," but offering no solid evidence to back the claim. He did not mention any audio or video evidence in the case. Erdogan was welcomed to the floor of the Turkish Parliament with applause from lawmakers of his own party on Tuesday. He first "honored the memory" of Khashoggi and extended his condolences to the journalist's wife and family. The Turkish leader said Kahashoggi's killing was "planned and executed" by the Saudi government. Turkish leader calls Khashoggi killing "political murder"
He said the first thing the 15-member Saudi team, which arrived on Oct. 2 via private jet in Istanbul, did upon reaching the consulate, was to disable the video cameras in the building. Erdogan also said Turkish investigators established quickly that Khashoggi had not left the consulate building, as the Saudis claimed in the days immediately after the journalist's disappearance, which set in motion an official investigation by a Turkish prosecutor. Erdogan dismissed Saudi Arabia's claims thus far -- that Khashoggi's killing was accidental and resulted from a "fist fight" -- as attempts to obscure the truth. He said Saudi Arabia's efforts to "hide" behind diplomatic immunity had not thwarted Turkey's investigation. 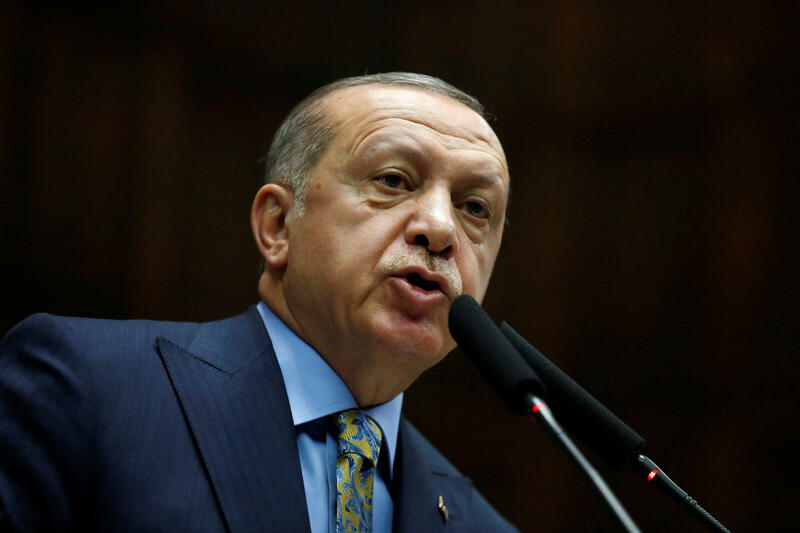 "To blame such an incident on a handful of security and intelligence members would not satisfy us or the international community," Erdogan said. "Saudi Arabia has taken an important step by admitting the murder. As of now we expect of them to openly bring to light those responsible -- from the highest ranked to the lowest -- and to bring them to justice." Erdogan suggested the Saudis allow the 18 people named by the kingdom as suspects in the case be put on trial in Turkey. After his speech, Erdogan had presented more questions than answers; wondering aloud why Saudi officials' story had changed so many times since Oct. 2, where Khashoggi's body is now, and who is the "local collaborator" cited by Saudi officials as disposing of the body after the killing. As Erdogan spoke in Ankara, Saudi King Salman and his son Crown Prince Mohammed bin Salman -- the man strongly suspected by Turkish officials and some senior U.S. lawmakers of sending a team to kill Khashoggi -- met the slain journalist's sons in Riyadh and had their photos taken shaking their hands. Saudi's state-run SPA news agency published photos of the encounters and said the two senior-most royals, "expressed their deepest condolences and sympathy to the family and relatives of the late Jamal Khashoggi." The SPA report said Sahl bin Ahmed Khashoggi and Salah bin Jamal Khashoggi, "expressed their great thanks" for the condolences from the royals, whose family have enjoyed absolute power in the kingdom for almost 100 years. Unnamed officials with connections to the Saudi royal family told various media outlets on Monday that Prince Salman's close aid, Saud al-Qahtani, was beamed into the room of the Istanbul consulate on Oct. 2 where Khashoggi was being detained, via video call. Turkish newspaper Sabah, which is aligned with Erdogan, reported that Qahtani insulted Khashoggi via video link, before telling his operatives in the room to, "bring me the head of the dog." Saudi Arabia has said Kashoggi, a critic of the Saudi royal family, was killed in a "fistfight" with officials sent to encourage him to return to the kingdom. The Saudi government insists Prince Salman was unaware of the operation and that it was the team on the ground in Istanbul which overstepped its duties and killed him accidentally, purportedly by placing him in a chokehold. Khashoggi's body was then rolled into a carpet and given to a "local collaborator," one Saudi official told CBS News. The official said the body was not cut up into pieces, as reports from Turkish sources have alleged. Erdogan insisted on Tuesday that the Saudis must identify the "collaborator." As CBS News correspondent Holly Williams reports, there's been no word yet on where Khashoggi's body actually ended up, but Turkish police found a Mercedes Benz, reportedly registered to the Saudi consulate and apparently abandoned about 10 miles away in an underground parking lot, on Monday. The vehicle was being searched. Erdogan was expected to speak on Tuesday as Saudi Arabia hosts a glitzy investment conference that many dignitaries have decided to skip because of the scandal. The kingdom's Energy Minister, Khalid al-Falih, said on stage at the conference that his country was in "crisis" over the journalist's "abhorrent" killing. It was not clear whether Crown Prince Salman would take the stage at any point during the conference. "As we know these are difficult days. We are going through a crisis," Falih said at the Future Investment Initiative, calling Khashoggi's killing "abhorrent"
Turkey's foreign minister said on Tuesday, meanwhile, that his country would cooperate with international bodies if they were to launch an independent probe into Khashoggi's killing. In an interview with state-run Anadolu Agency, Mevlut Cavusoglu also reiterated on Tuesday that Turkey had not shared any evidence concerning the Saudi writer's death at the Saudi consulate with any country, but he added that there may have been "an exchange of views between intelligence organizations." Earlier Monday, President Trump told reporters that the U.S. had "top intelligence people in Turkey," but he didn't specify who he meant.